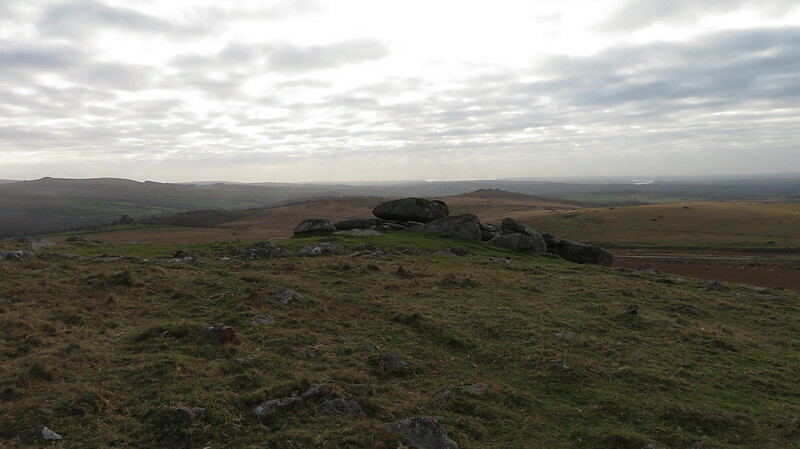 Then, Little Cox Tor, commanding great views of West Devon and across to Brent Tor. 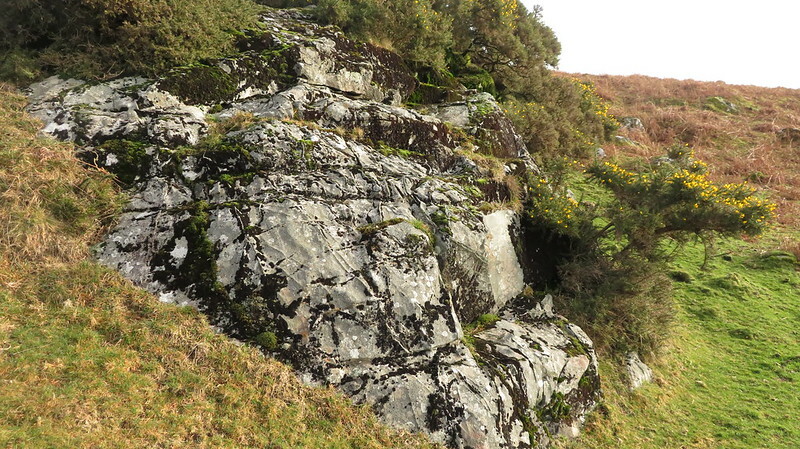 Like Lower Cox Tor, gorse clings onto the rocks. 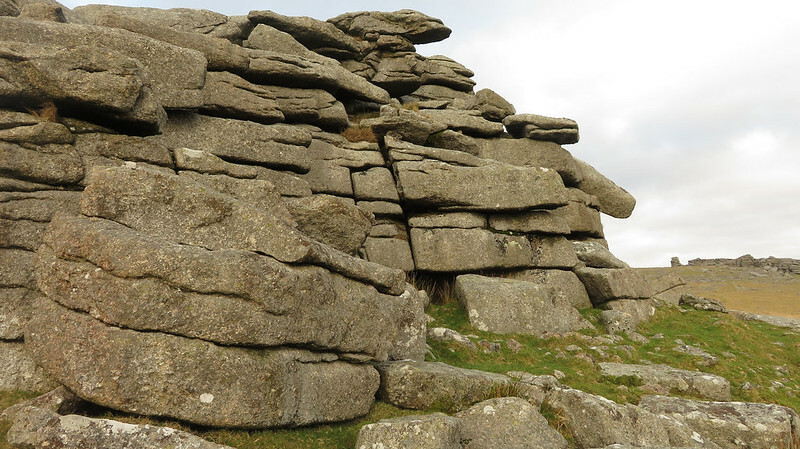 Cox Tor is a difficult tor to pin-point as the outcrops are so spread out on Coxtor Hill. 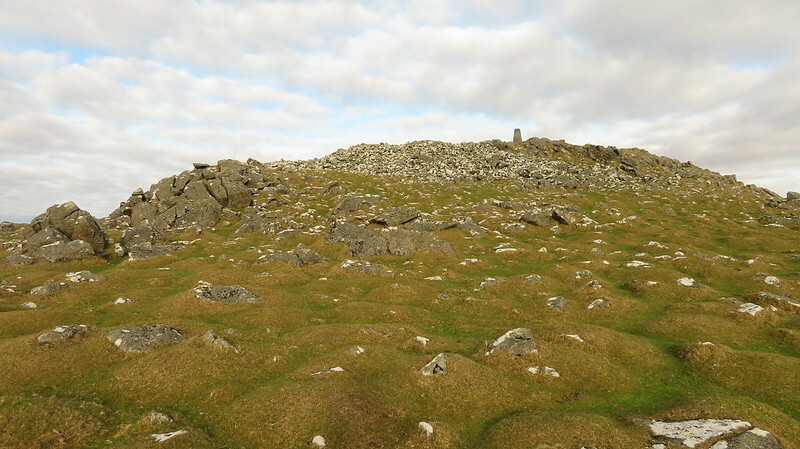 The summit outcrop is tiny and adorned by a large cairn and OS trig point. 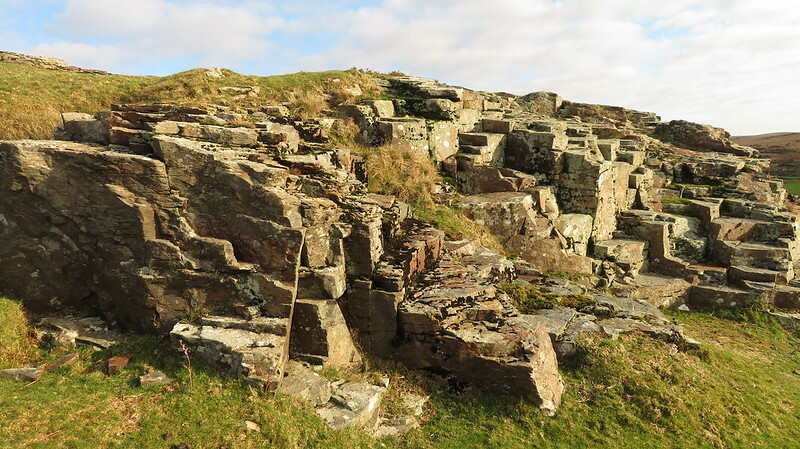 There are many scattered outcrops to the south, west and even far north. 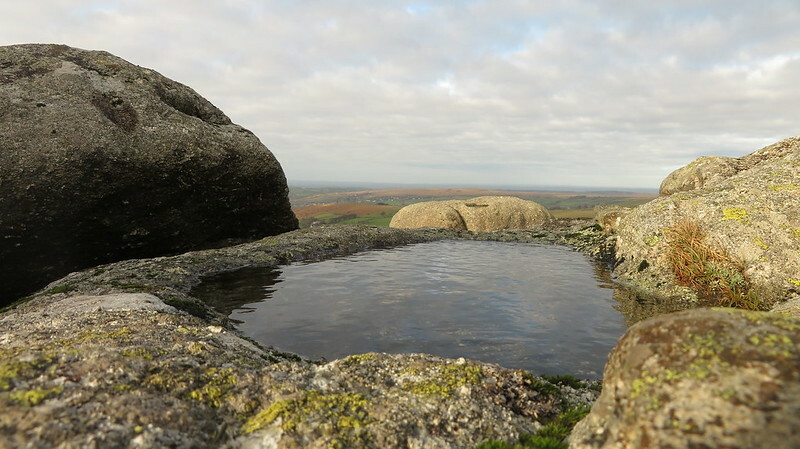 We dropped down to Beckamoor Dip, marked by a small tarn. 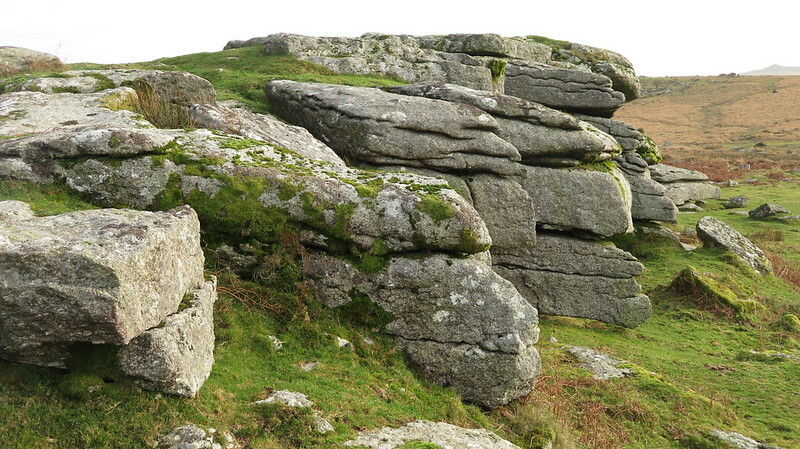 This marks the boundary of granite and metamorphic rock. 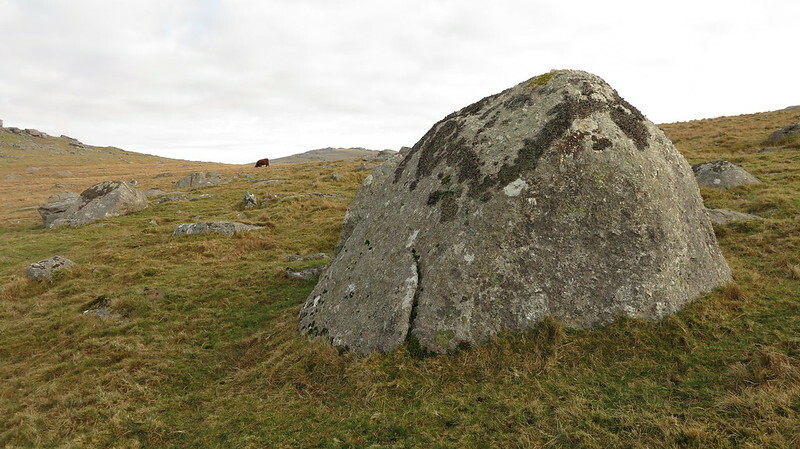 We went in search of Picket Rock, a boundary stone, but a natural boulder. 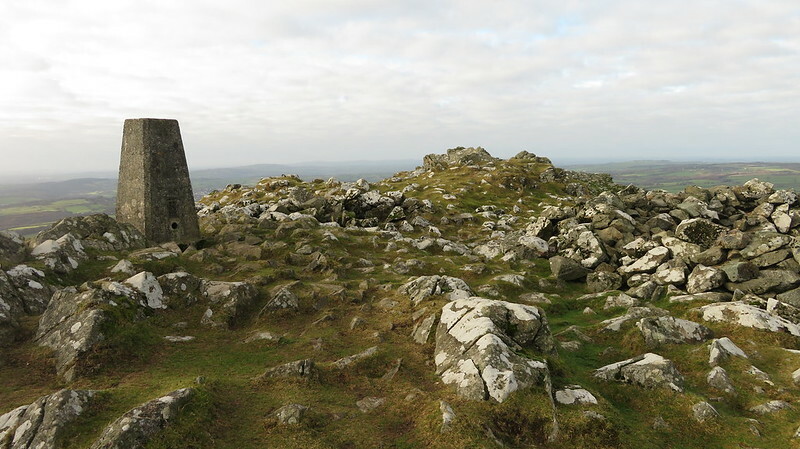 It marks the boundary, with other stones in the area, between the parishes of Peter Tavy and Whitchurch in West Devon. 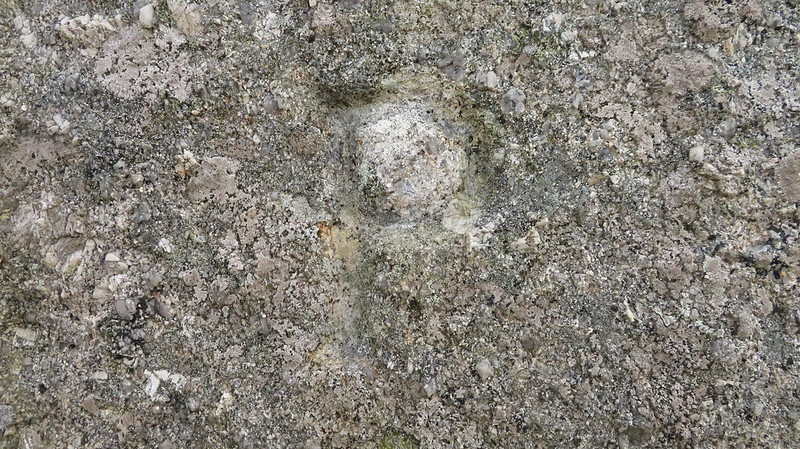 The rock is inscribed on two sides with a 'P' and a 'W' to represent this. 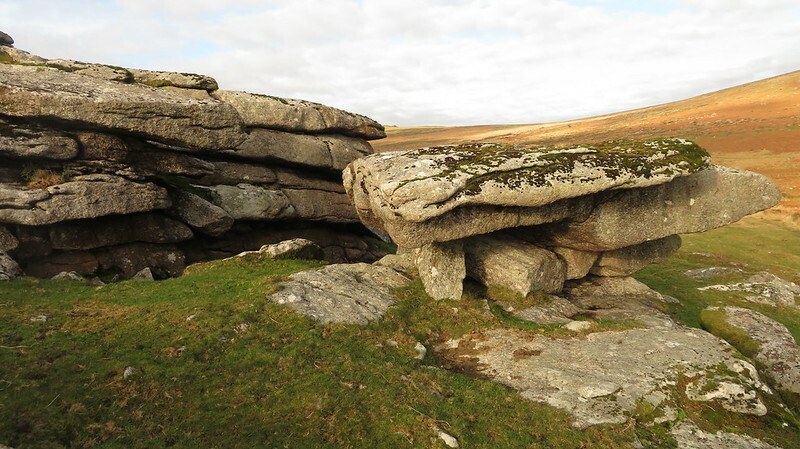 Roos Tor is a short distance away. 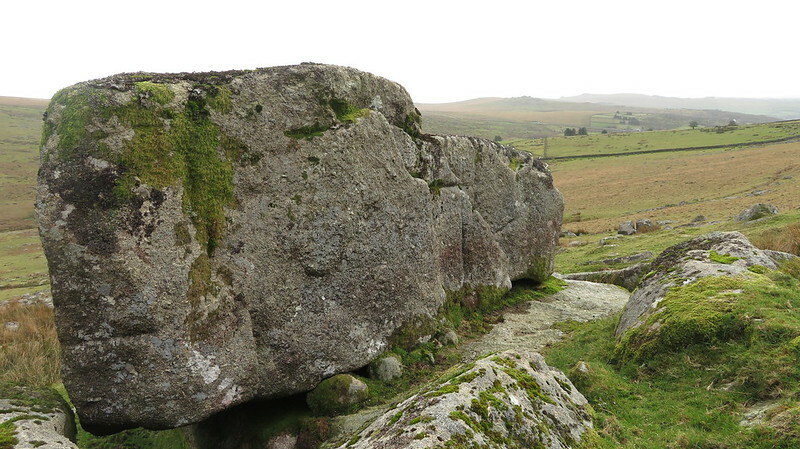 This is a very good tor, and perhaps the best of the walk. 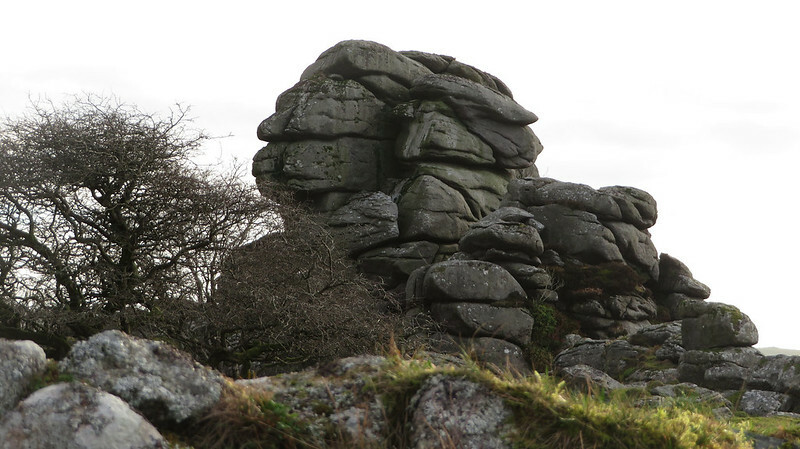 So many people head up to Great Staple Tor for photography, which means this tor is usually quiet despite it being easy to get to. 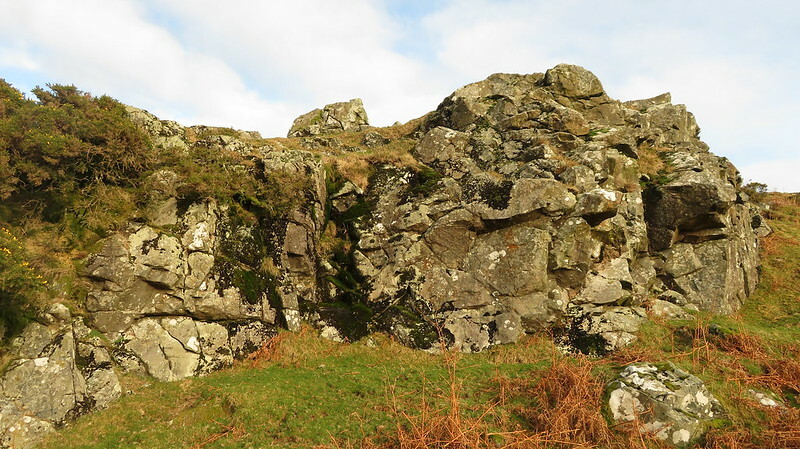 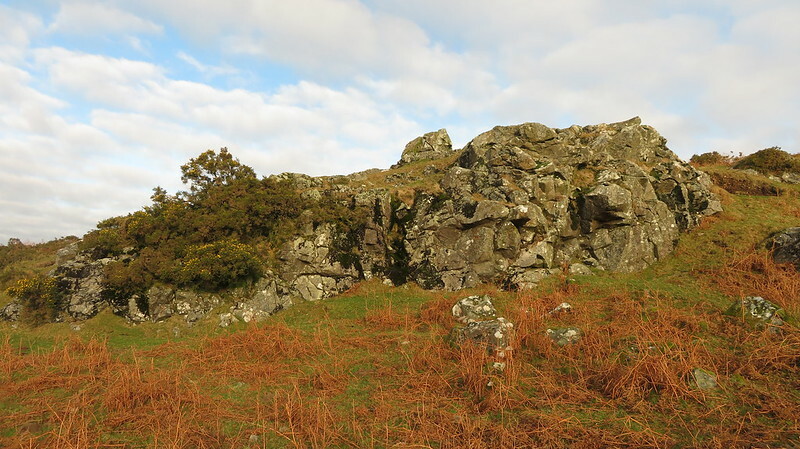 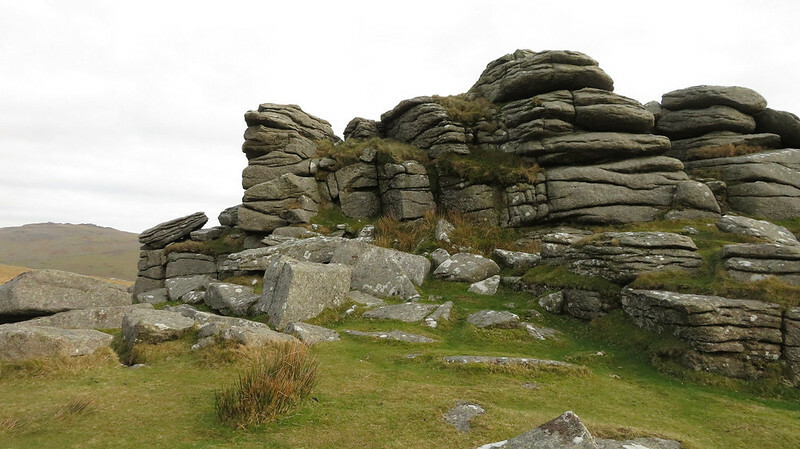 Instead of heading to Great Staple Tor next, we descended north-east to Little Roos Tor, a ruinous outcrop. 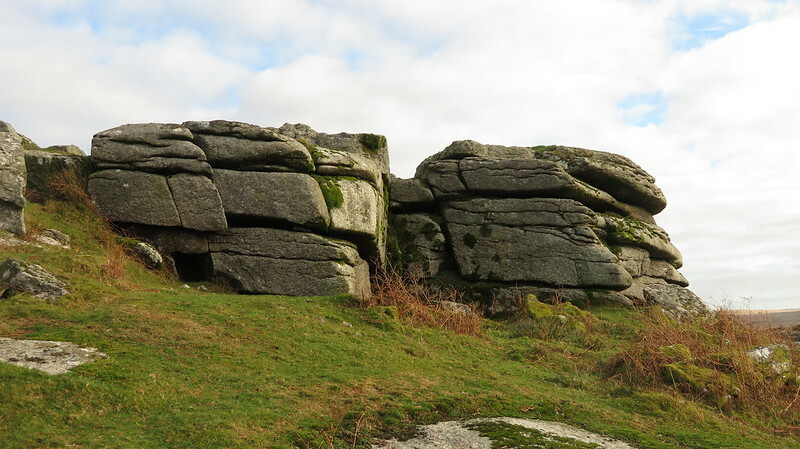 Great Staple Tor is a fantastic tor, consisting of two impressive towers of granite forming an avenue against the several other large outcrops here. 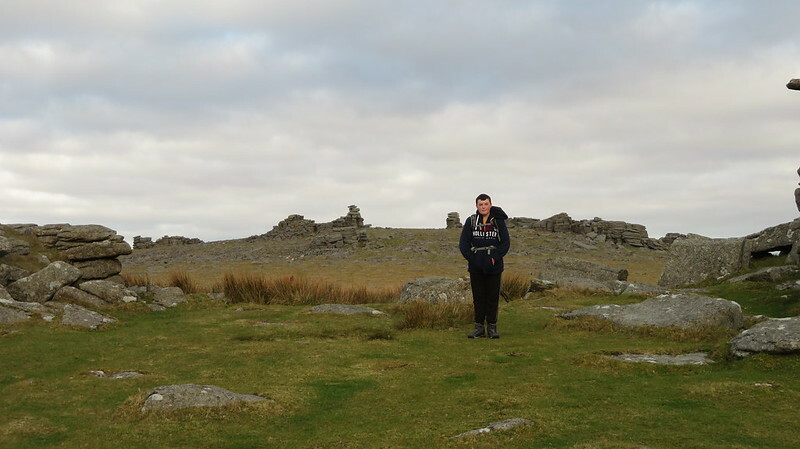 But I do think it is over photographed, which detracts from the satisfaction of the bag. 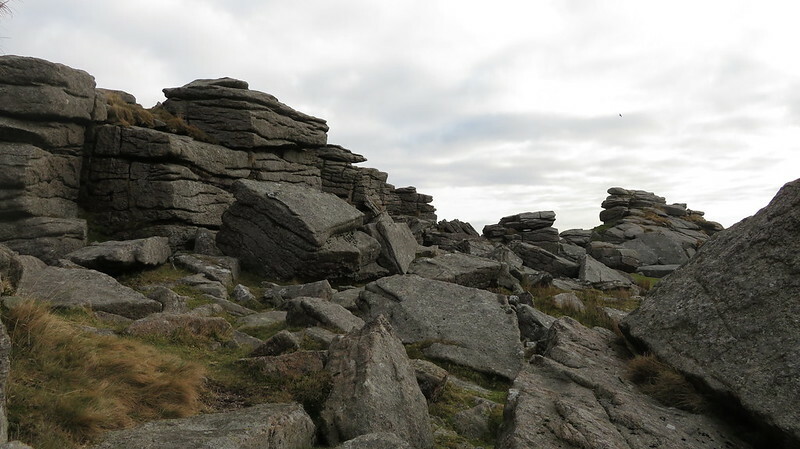 Next up, Middle Staple Tor. 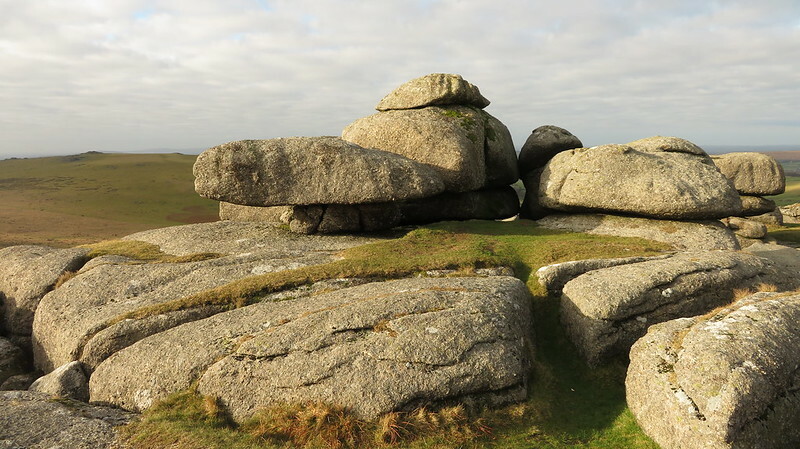 This tor is one large outcrop, bulky in appearance, and offers the same good views that its "Great" neighbour provides. 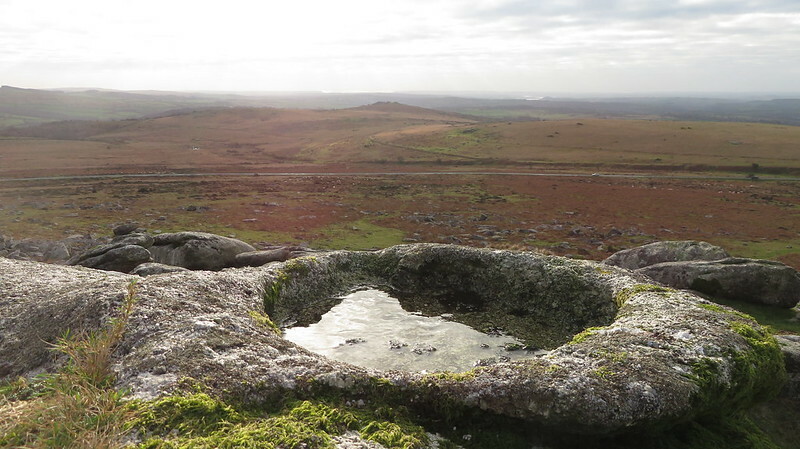 Little Staple Tor, lower down, is my favourite of the three Staple's, purely because of its fabulous underrated rock basin. 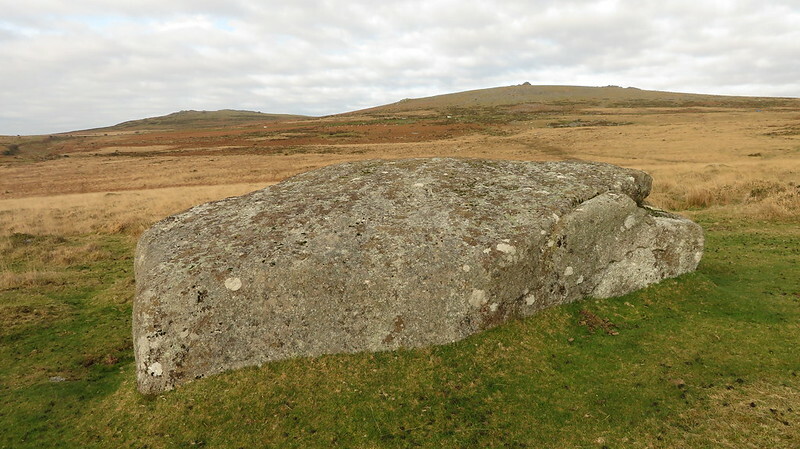 Tim Jenkinson measured the size to be at 77cm x 64cm, the depth at 10cm. 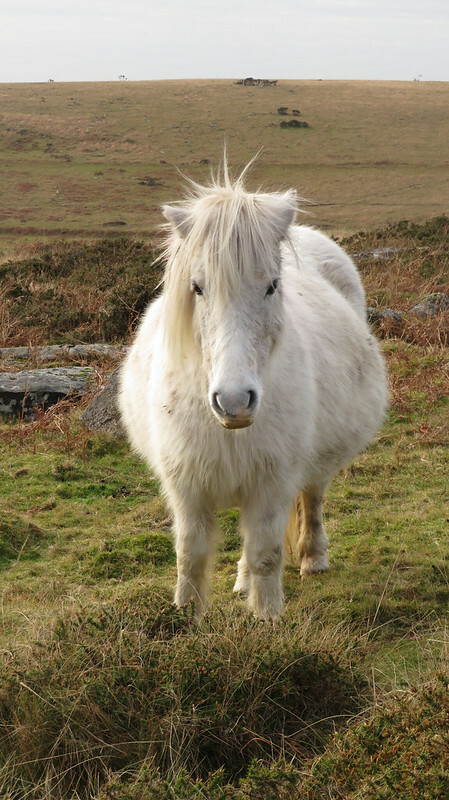 Aiming to cross the B3357 road we were distracted by some ponies, one of which followed us for a couple hundred metres. 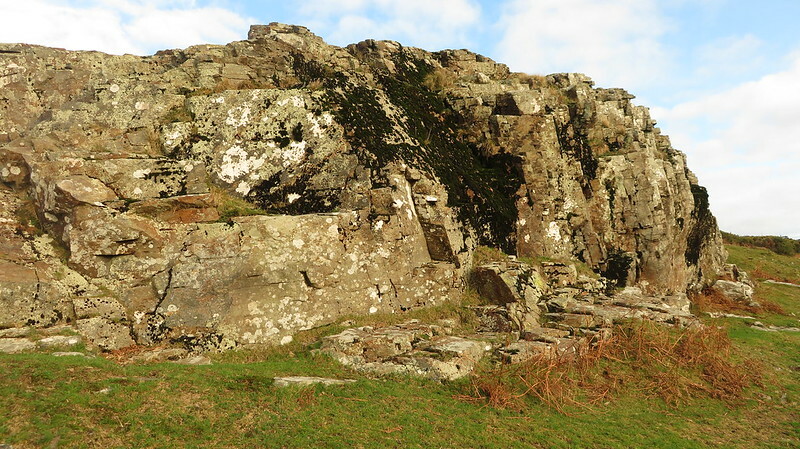 The path to Saddle Rock was quite boggy, a surprise given how dry it has been recently. 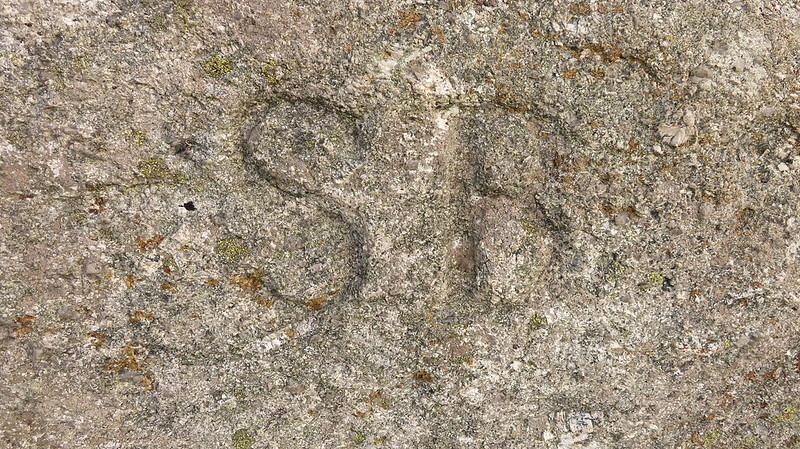 The Rock itself is disappointing and its only element of significance is the "SB" engraved into it. 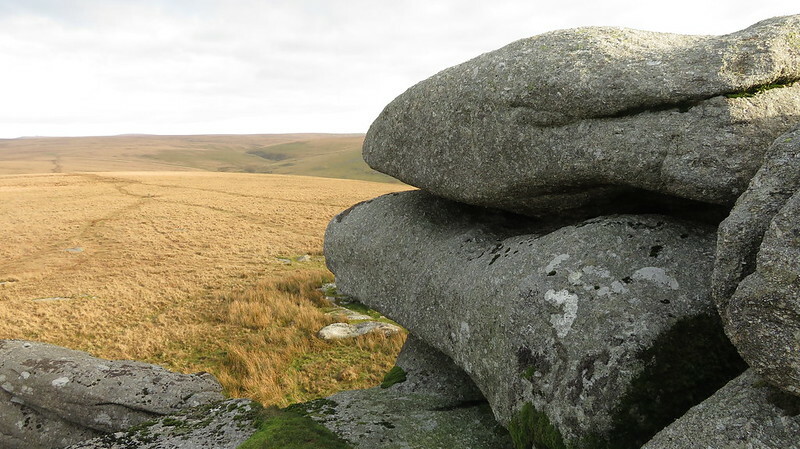 This is as close as you can get to see Vixen Tor, from Public Land. 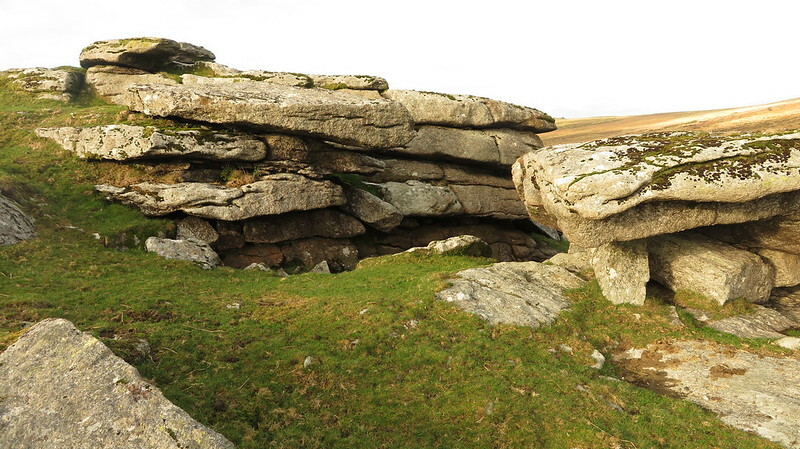 We had to hop across two minor streams while trying to get to Feather Tor. 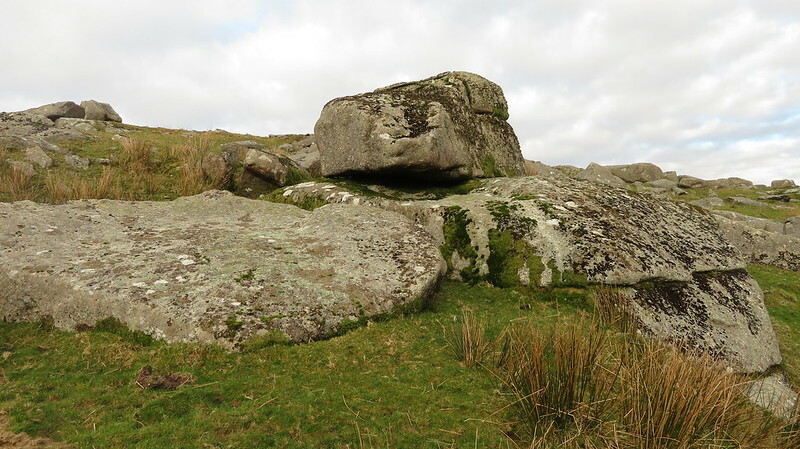 I like this tor, it is small but fine in its appearance and location. 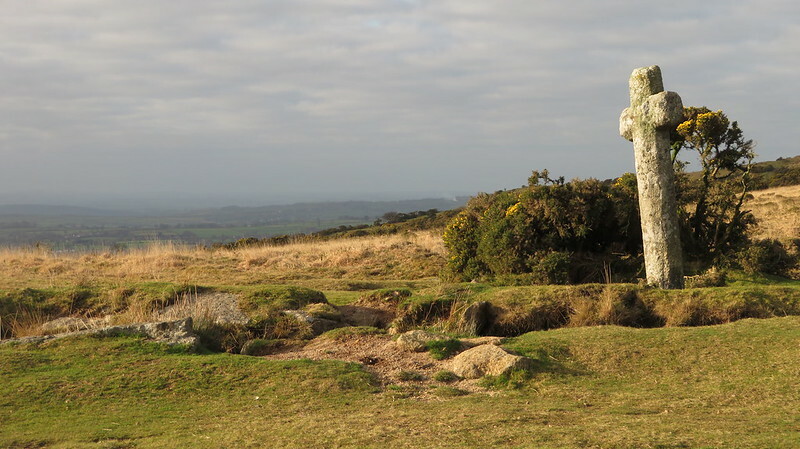 It has very good views. 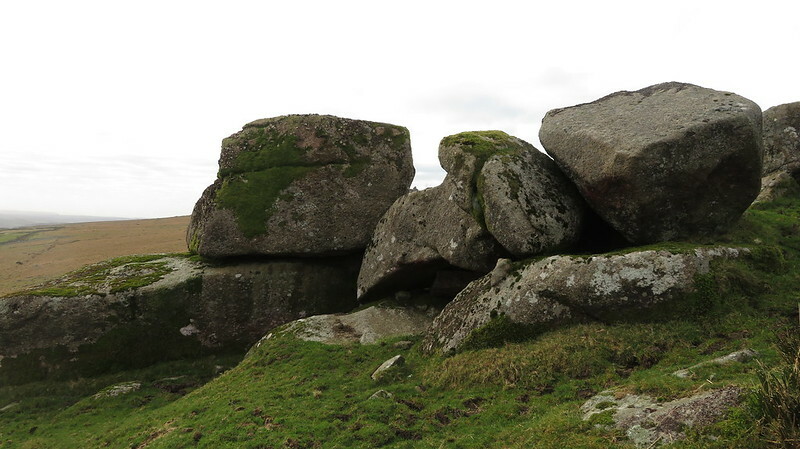 I was keen to see Windy Post Cross, just north of here, beside the Grimstone and Sortridge Leat. 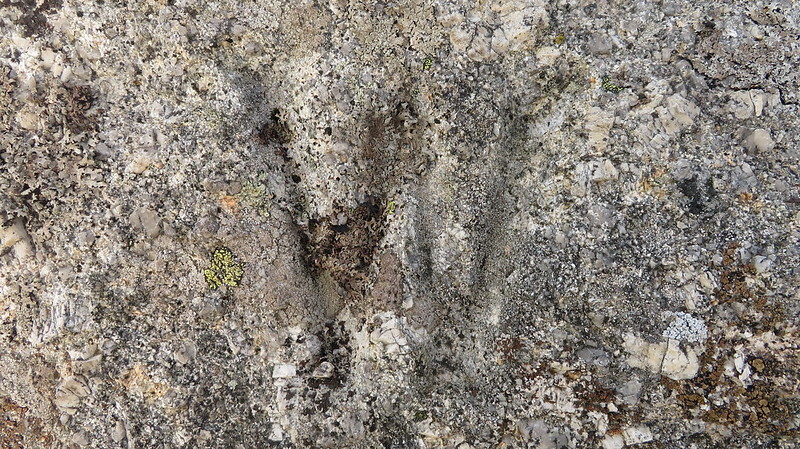 Not to my surprise, there was already someone there taking some shots of it. 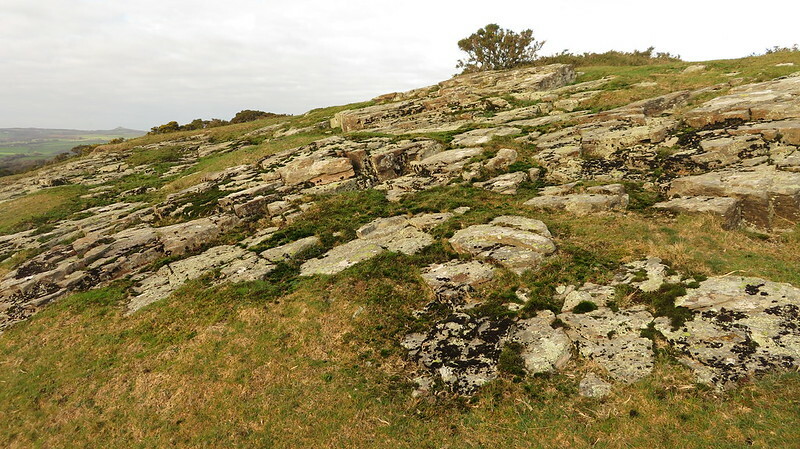 Barn Hill Rocks sit atop Barn Hill (funnily enough), but the best of the outcrops lies to the east of the summit. 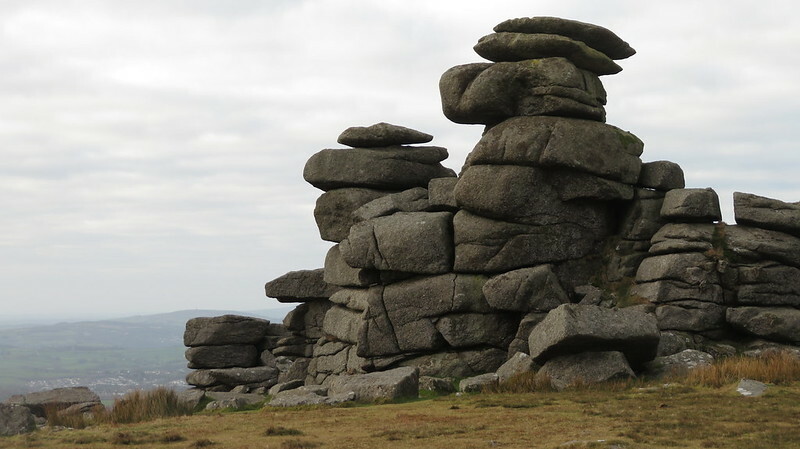 One more tor to go, stay with me! 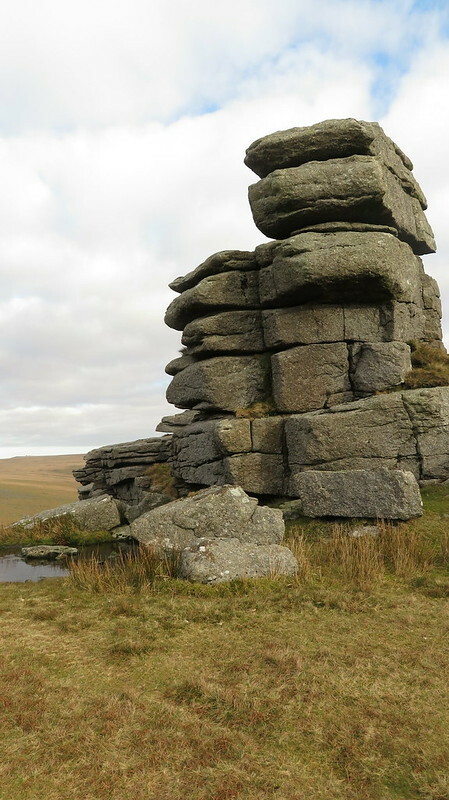 I realise that this is quite a long post as it is, but there's just so much to describe and show; I haven't even gone into detail. 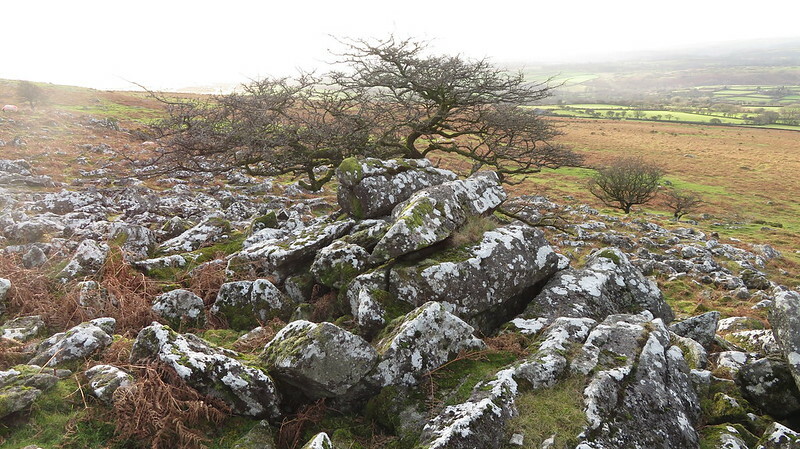 Westward, is Prowtytown Rocks, a beautiful end to a good walk. 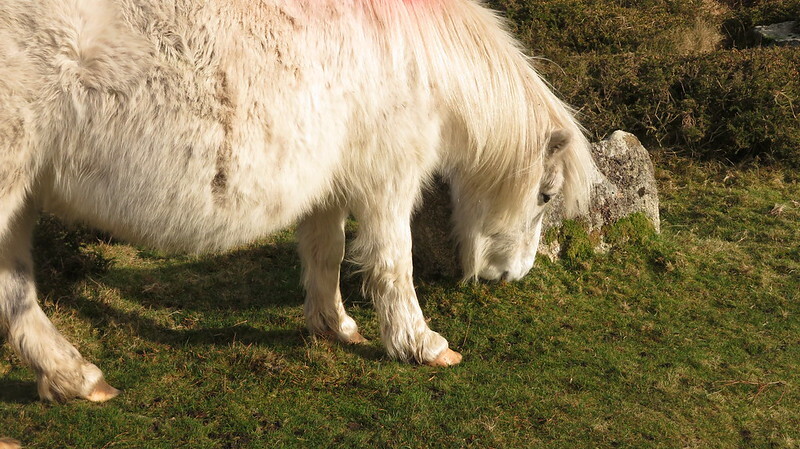 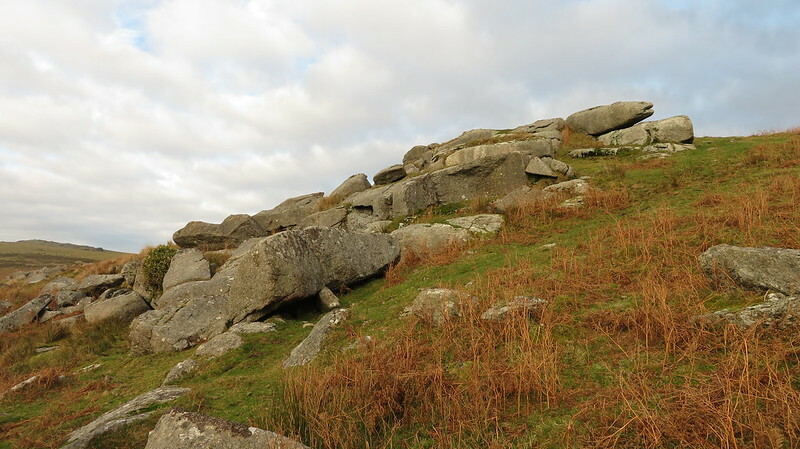 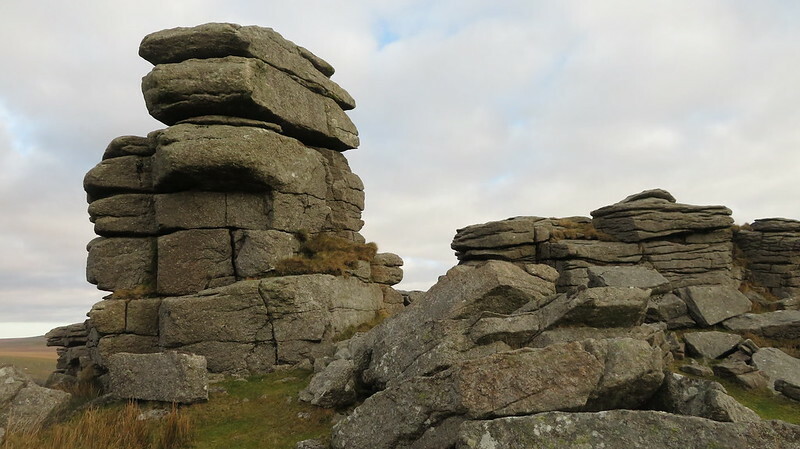 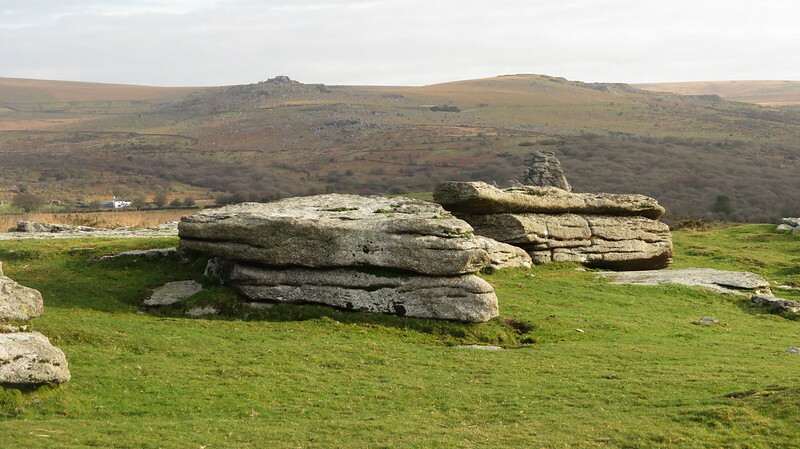 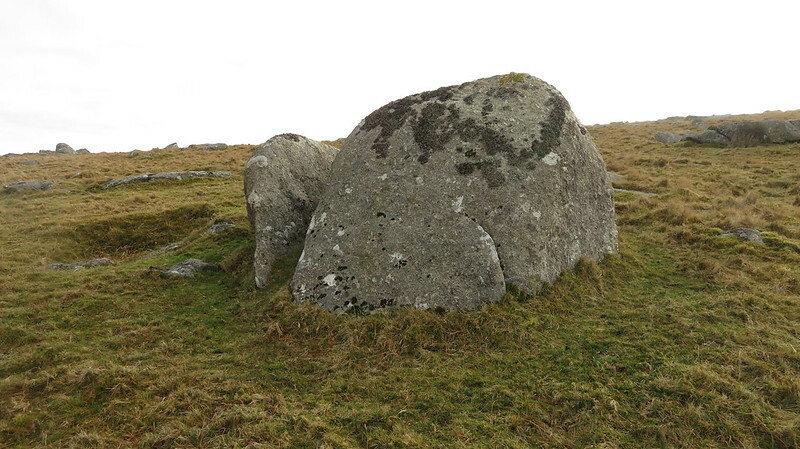 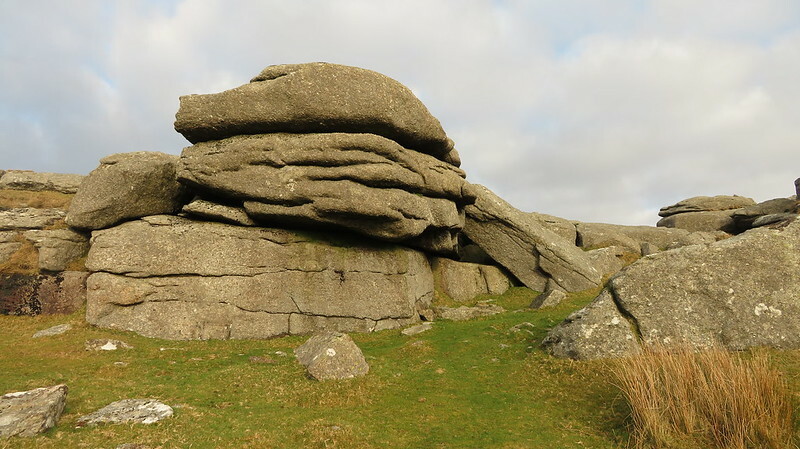 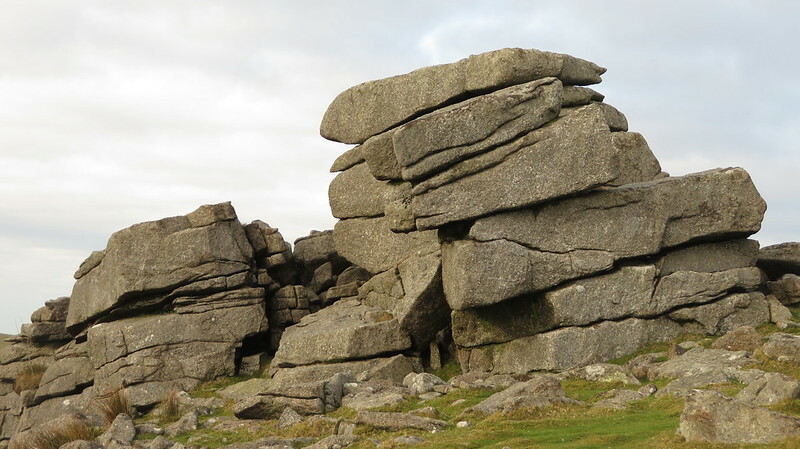 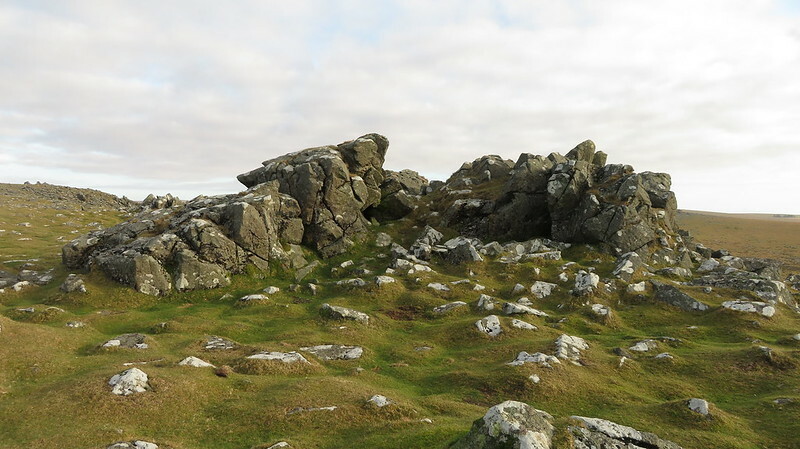 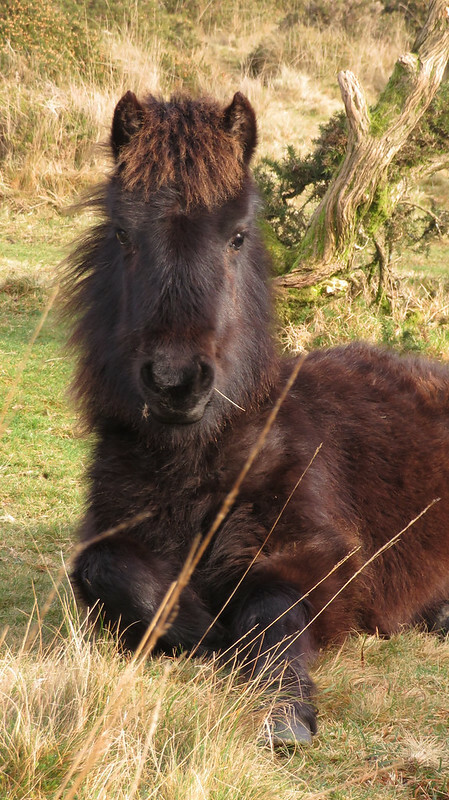 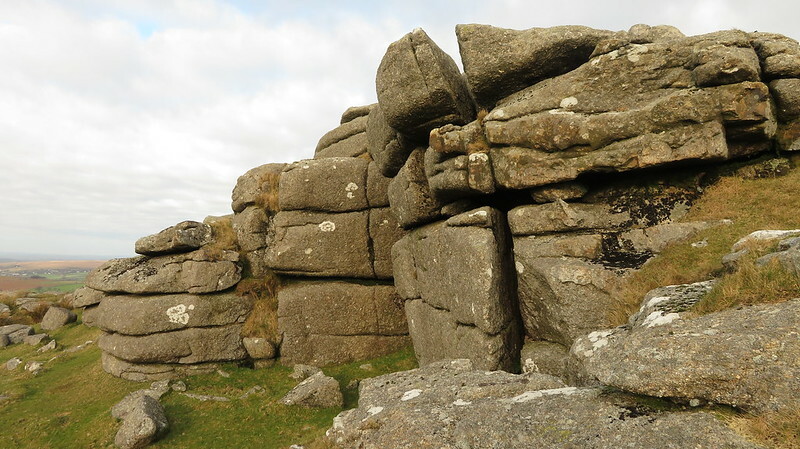 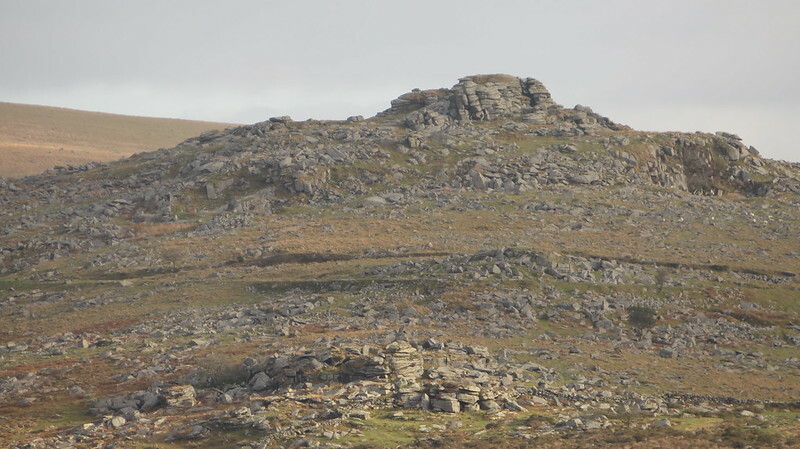 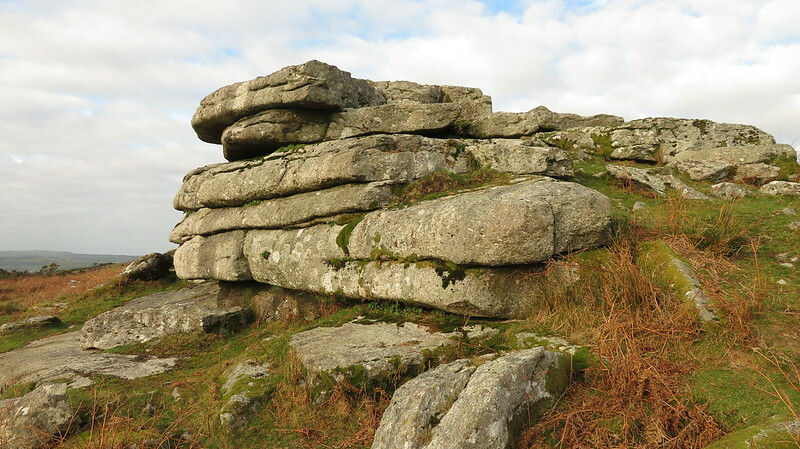 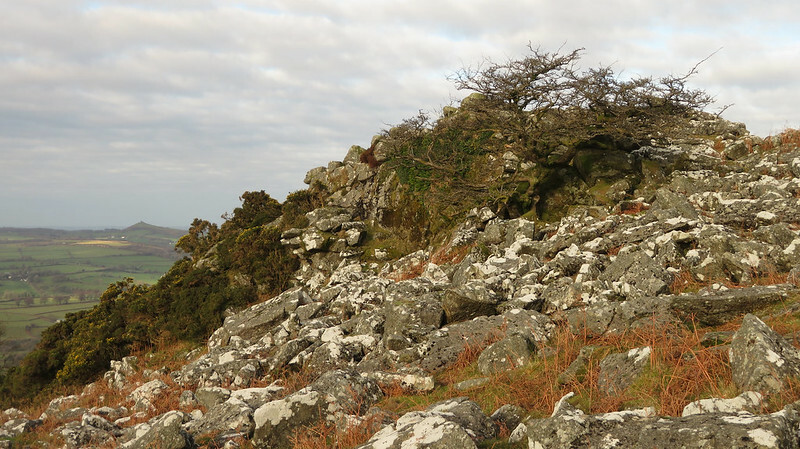 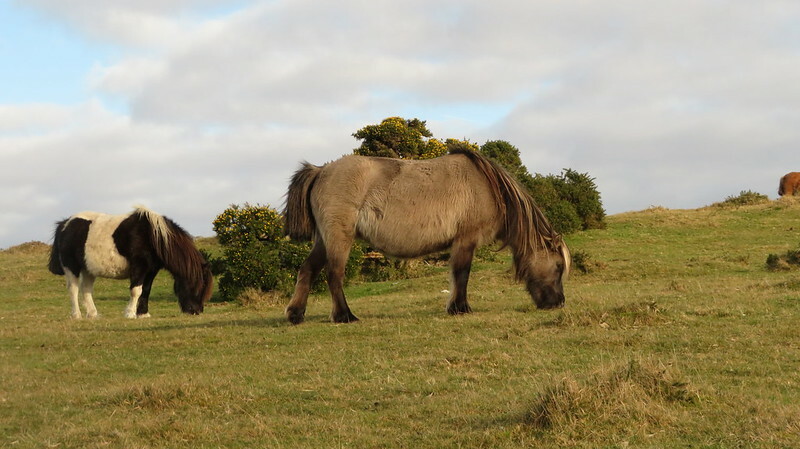 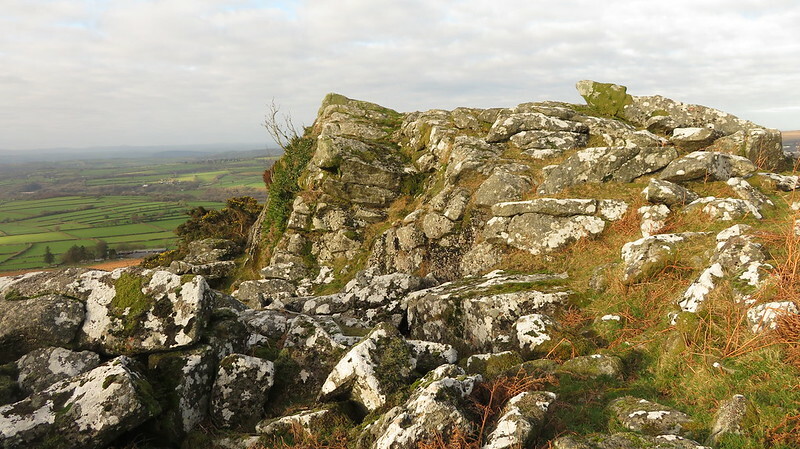 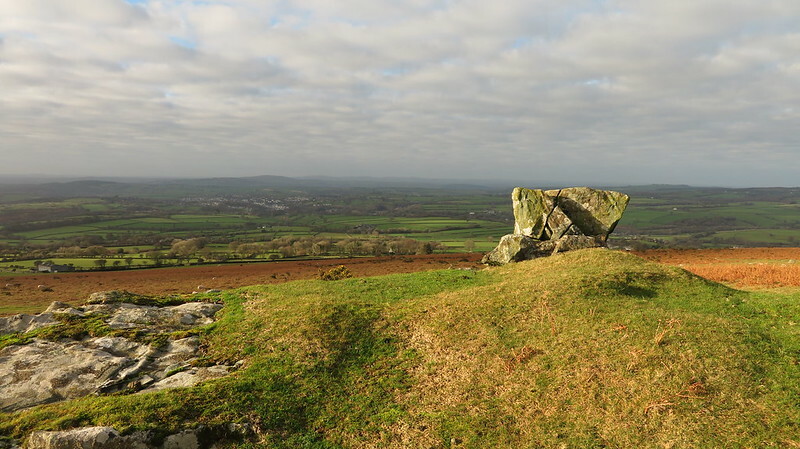 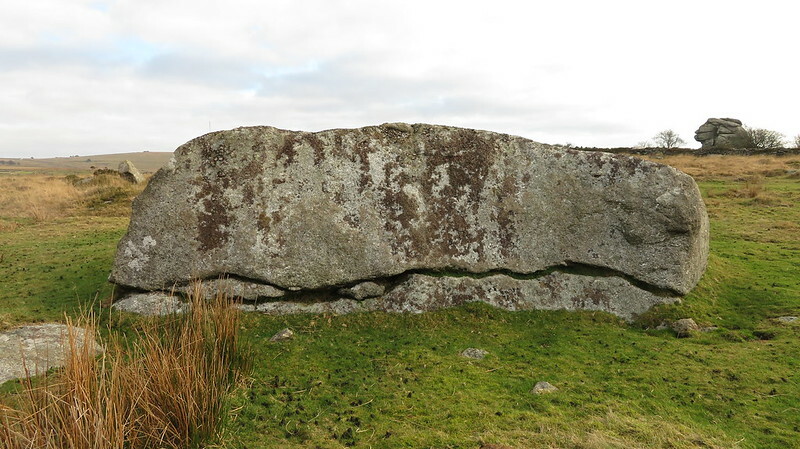 Eric Hemery, in High Dartmoor; "Above all rises the border-rock tor known as Prowtytown Rocks (1,000 feet), representing the final, lowly bastion of the Tavy country's east upper valley side.."
Back at Pork Hill car park, there was a Willy's Ice Cream van. 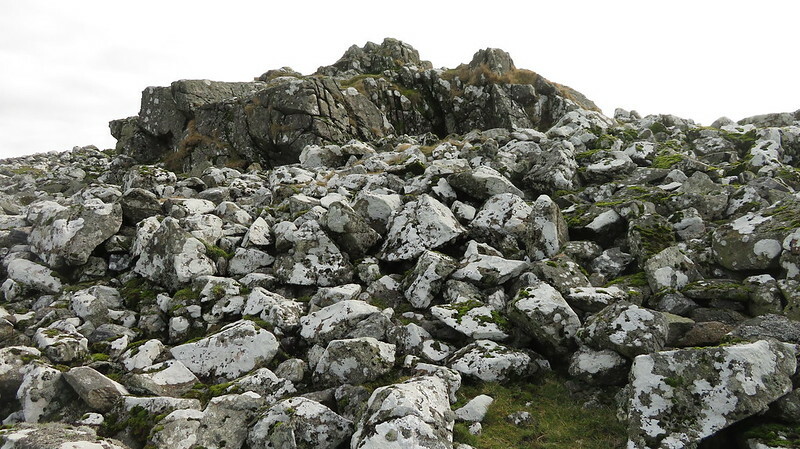 Yet again I didn't have one, sorry Matthew King. 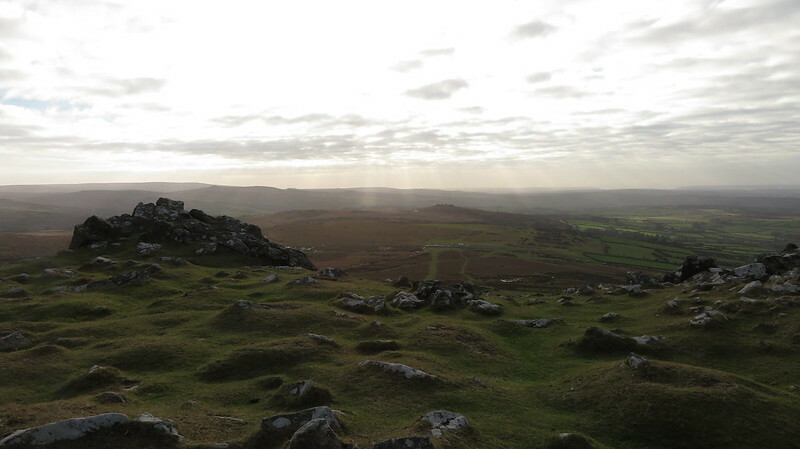 Instead, we drove to the Fox Tor Cafe in Princetown for a late lunch.